The credibility of your business is reflected through your website design. Since your business might have to fight a battle to sustain, web design serves as an efficient tool to win the battle by making your business stand out in the competition. Customers rely on your website when looking for any services or products. While an appealing design can successfully retain online users on your website, a bad website design is enough to drive away potential customers. Therefore, to allow your business to gain recognition, it is vital to get a suitable design to reflect the best features of your business. iLocal, Inc. is a trusted company operating in Seattle. Along with a team of expert web designers we emphasize on features, like easy accessibility, high responsiveness and multi browser compatibility, to make sure your site is easily accessible to every online user, irrespective of the device he uses. An expert web designer very well understands the importance of having a good website for the right exposure of business. Being a reliable name in Seattle, we, at iLocal, Inc offer the latest web design services to ensure a superior browsing experience for your customers. Our expert web designers have the knowledge to build competitive website for your company. By handling your website project efficiently, we allow you to focus on your core business tasks. To get effective results from a professionally designed website, make sure to hire a renowned web design company. Only an experienced company can help you achieve the popularity you look for your business. Serving in Seattle for the past so many years, iLocal, Inc has evolved as a trusted company to render impressive and excellent website designing services. Providing quality graphics, attractive landing pages and relevant content, we make sure to attract maximum customers, who can get a clear idea of your services. Emphasizing on latest online marketing strategies, our expert team regularly updates and maintains your website to enhance its functionality. 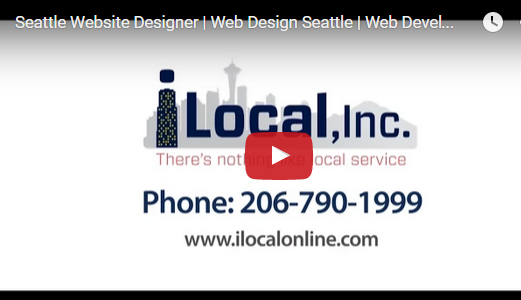 To get premium web design services in Seattle, call iLocal, Inc. at 206-790-1999.